Animal cell, computer artwork. 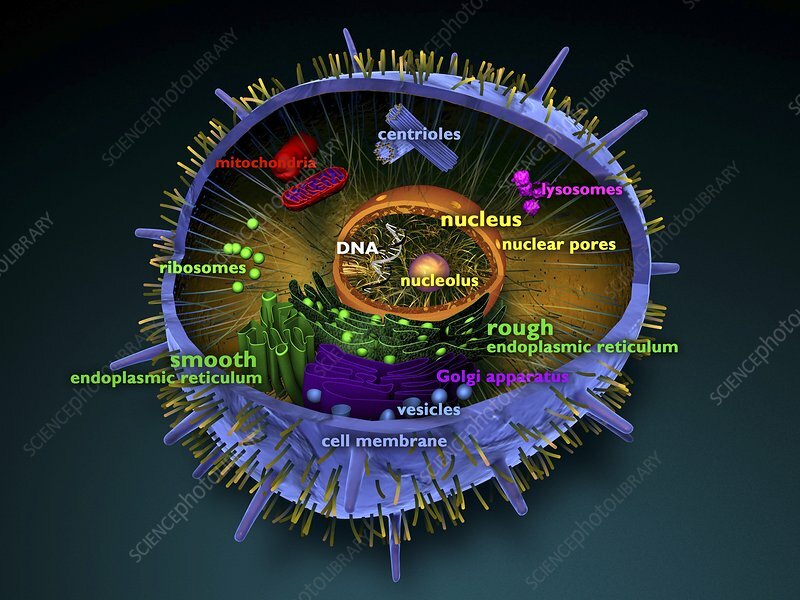 Typical animal cell showing cellular structure and organelles. At centre is the nucleus (orange), which contains the cell's genetic information in the form of DNA (deoxyribonucleic acid). Surrounding the nucleus is a highly folded membrane-bound organelle called the endoplasmic reticulum (ER). The ER is the site of lipid synthesis and the production of membrane-bound proteins. ER may be either rough (RER), that is with ribosomes (green spheres), or smooth (SER), without ribosomes. The Golgi apparatus (purple) is another folded membrane-bound organelle that modifies and packages proteins. Mitochondria (red) produce the cell's energy.